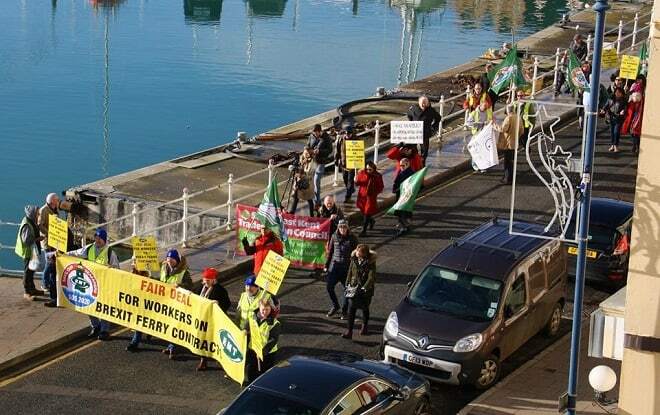 Members of maritime union RMT are currently holding a demonstration at Ramsgate Port. 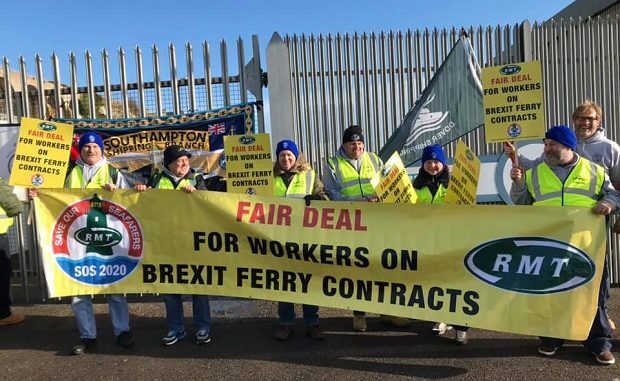 They are demanding a fair deal for British workers on Brexit ferry contracts following the government deal with three fims, including Seaborne Freight for ‘extra capacity’ ferry service in the event of a no-deal Brexit. 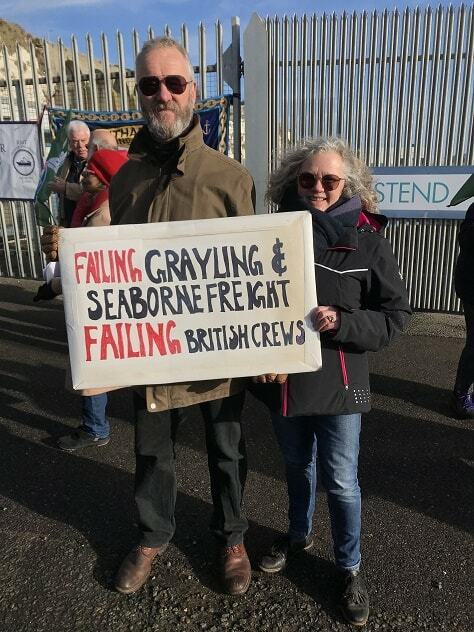 Seaborne, which proposes a Ramsgate/Ostend service, has been awarded a £13.8million government contract to provide extra ferry capacity even though it is a start-up company with no vessels or track record as yet. The RMT says it fears the deals, which have also been made with French company Brittany Ferries, receiving £46m and Danish DFDS with an award of £47m, will open the door to exploitation of foreign nationals at the expense of UK seafarers. Despite Mr Grayling’s comments that the deal with Seaborne is a demonstration of support for a small British firm, Companies House shows that many of the shares are held by French nationals. The RMT says Transport Secretary Chris Grayling refuses commit to the new Government-contracted services being crewed by UK seafarers – fuelling union fears that they will be staffed up with low cost foreign nationals working on shoddy, insecure conditions and paid below National Minimum Wage rates. The RMT wants assurances of all ferries to be fully crewed up with UK ratings‎, recognition of UK trade unions and UK employment laws to be fully complied with. RMT General Secretary, Mick Cash said:“There has been a barrage of publicity around the Government’s Brexit ferry contracts and the union has written to both Chris Grayling, who is in control of the arrangements, and the companies involved demanding basic assurances on UK ratings jobs, union recognition and full compliance with UK employment laws. “The only response we have had back so far is an insulting and contemptuous tirade of abuse towards the front line ferry workforce from the Maritime Minister. Questions have been raised over how ship and passenger safety surveys, under the International Safety Management Code (ISM Code), can be carried out by Seaborne before ships put to water given the tight timeframe and whether an operating manual and shore office inspection can be produced in time. 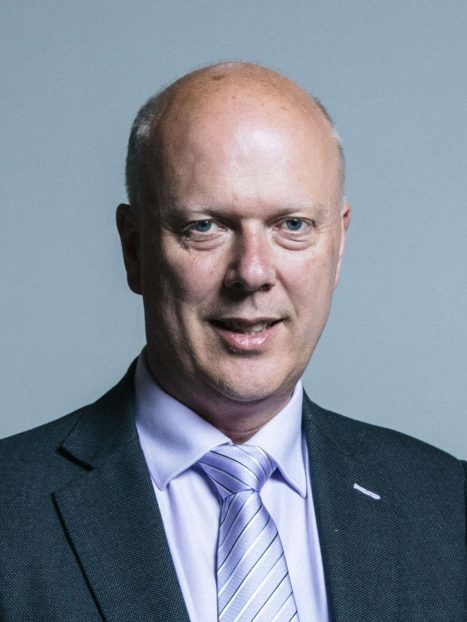 However, a statement from Chris Grayling says: “The department has reviewed their plans for sourcing vessels with the support of external advisers. A number of large institutional investors are backing this service and the government’s contract represents a small part of the overall investment required by Seaborne to open this route. County councillor Karen Constantine is at the demo. She said: “Many people do not understand how poorly treated seafarers can be treated. The rates of pay can be astonishing low. In some cases as low as a few pounds per hour. In some cases as low as £2.70 per hour. “The RMT have, through years of fighting managed to secure better wages and terms and conditions in the South East. It is therefore imperative that any ferries commissioned to use Ramsgate Port do pay the real living wage and do recognise the RMT and other unions as appropriate. South Thanet MP Craig Mackinlay has backed the government deal with Seaborne Freight. He said: “If the government were to do no planning for Brexit eventualities, they would be condemned and now they are actually doing sensible planning, they now face derision. The company hasn’t got a ship yet and they are on strike. What are they? French? This could be our Brexit future. Did Brexit voters really think that private, profit-making firms would somehow favour British workers after Brexit? Now we see the reality that, even this abnormally well connected no-ferry Ferry company has to be pushed by the Union to even consider taking on British crews. Brexit is NOT about protecting British people. It is about making British people compete for scraps without even having the Worker Protections that we currently have in the EU. I have the greatest sympathy for the RMT Union members who are demonstrating in Ramsgate. And I will also sympathise with the thousands of other British workers in our Brexit future who will find that the Tory government is quick to wave Union Jacks and spout about “taking back control” but will somehow fail to be all that “patriotic” when it comes to jobs and livlehoods in Britain. The rich Brexit supporters have investments all over the world so Brexit will not harm hem. WE, the majority of Britons, don’t have those investments so we will be stuck with a failing economy. ‘Adam’ -Who’s on strike? Take the time to read the article before posting nonsense. They are the RMT, they simply cause issues where none exist, they live in the 1950’s and think the rest of us should. They are a prime example of why union controls should be extended. It’s not surprising that large new businesses never get started in Thanet when the Unions and others get on their high horses and complain before they even get out of the starting blocks. It’s also worth pointing out that the British economy is not all doom and gloom as many would like to make out. Pre-Referendum the UK was performing better than most other EU countries, and even now today the lowest unemployment figures for years have been announced. Something must be seriously wrong with the *local* economy such that this situation never seems to filter through to this part of the world. I think we need to start asking the question “Why not?”. Because we have seen our mp in Margate helping to destroy the fabric of our services, shuting hospitals, selling council houses, supporting universal credits , a loyal Tory who does not help the economy of Margate. “Why doesn’t the good news about the UK filter through to this part of the country?” A good question. But I would suggest that there are more jobs about because wages are so low. Also, more jobs are insecure, “here today, gone tomorrow” type jobs , or even zero hours contracts where you don’t know if you will be working or not from one day to the next. With Universal Credit, horrendously low wages are increased to poverty-level wages by government benefits. So the tax-payer subsidises the employers. No wonder they hire more workers when they only have to pay a proportion of the wage-bill. The taxpayer pays the rest. But rents and mortgages continue rising. So the “good news” doesn’t filter through to many parts of Britain despite all the government efforts and the daily propaganda in their newspapers. How can it feel like “good news” if you are in a job that barely covers the bills for gas and electricity and you know that the job could disappear any day, throwing you onto Universal Credit that isn’t payed for at least 5 weeks so you have to ask for the voucher to go to the Food Bank to feed the family. And as for your fate should you ever fall ill….don’t get me started! Demonstrating outside a closed port. Not even a busy road. RMT. Cannot even supply seafarers when required by UK flagged firms.